How much does a bike like that cost? Apparently the Bullitt is interesting. Yes, sure. My “expensive” bike cost less than your mattress or the flat-screen television you keep in the kitchen. 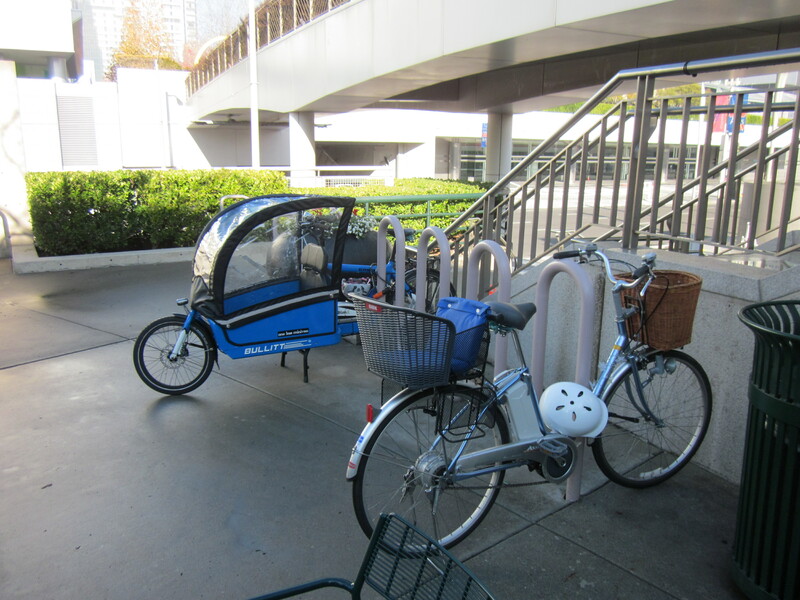 Riding bikes for transportation is cheap, but unless you get the bike for free, it’s not that cheap. And nobody picks up a free Bullitt at the dump. I suppose I should use another picture of the Brompton sometime. I still never know what to say when people ask me what our Brompton cost. Usually something like, “Well, it depends on the options.” This is true, but it’s kind of lame. Luckily for me, bikes really do cost less to maintain than scooters or cars, because right now the Bullitt is in the shop and won’t be fixed until Splendid Cycles comes back from vacation next week at the earliest (something has gone awry with our customized front shifter). 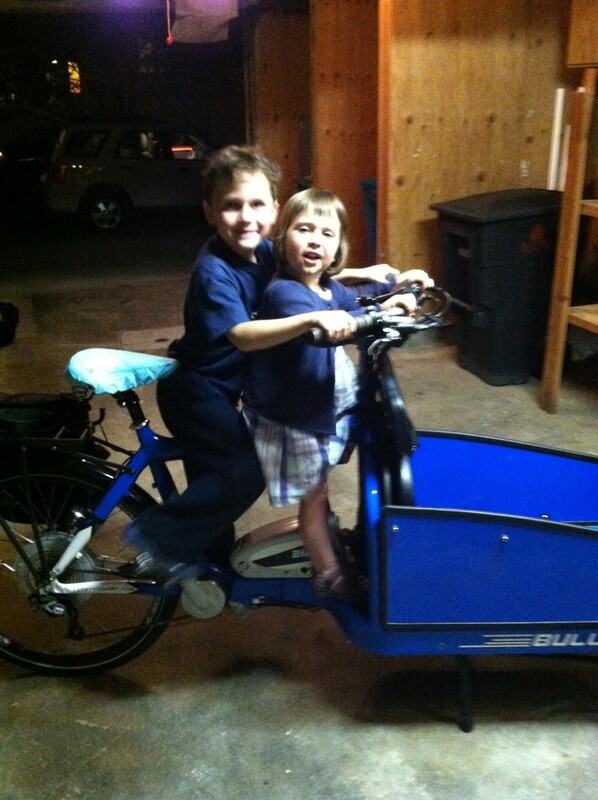 Its long vacation has turned out to be a bigger hassle than I expected given that we have backup bikes. 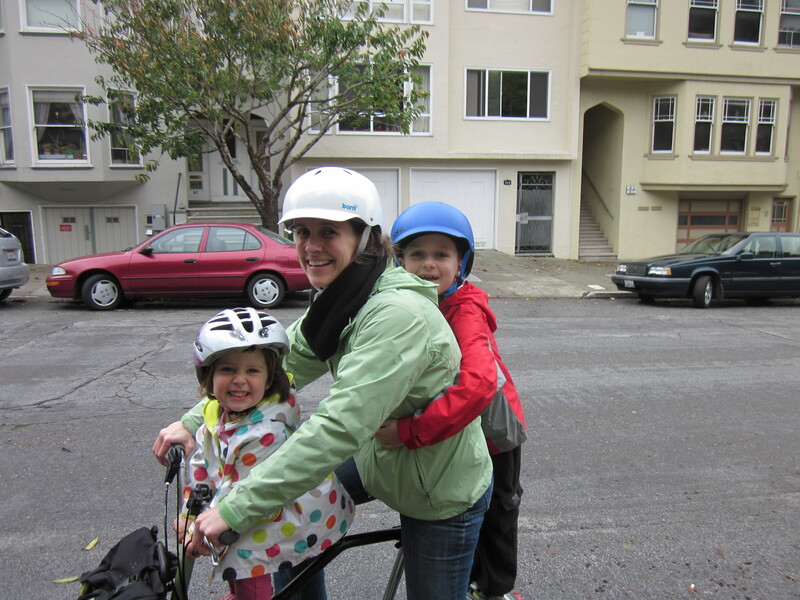 Now that we’re used to having a real cargo bike, it’s crazy-making to not be able to haul big loads and cover the kids in the cold or the rain. But it’s not going to cost a thousand dollars to fix. It’s not like repairing a car. And this confidence I have that even the most depressingly expensive bike repair is easy to cover from our monthly cash flow is probably the best news of all. How much does a bike like that cost? Over the long term: nothing worth mentioning. I get that question when I ride my Bullitt a lot. Most of the time I just shrug my shoulders because the buy-once, ride-forever model is hard to describe while tooling along.